A full-sized Skaugr being cared for by an Aelvar. Intent: To flesh out the Forest of Averlorn, home of the Aelvar of Midvinter. Average Lifespan: Hundreds of thousands of years. Description: An ancient species as old as the planet Midvinter itself, these treekin have remained unknown to the vast majority of said world's inhabitants. The elves of Averlorn live in symbiosis with them, and act as their caretakers and eternal allies. Breathes: Type I; carbon dioxide, water. 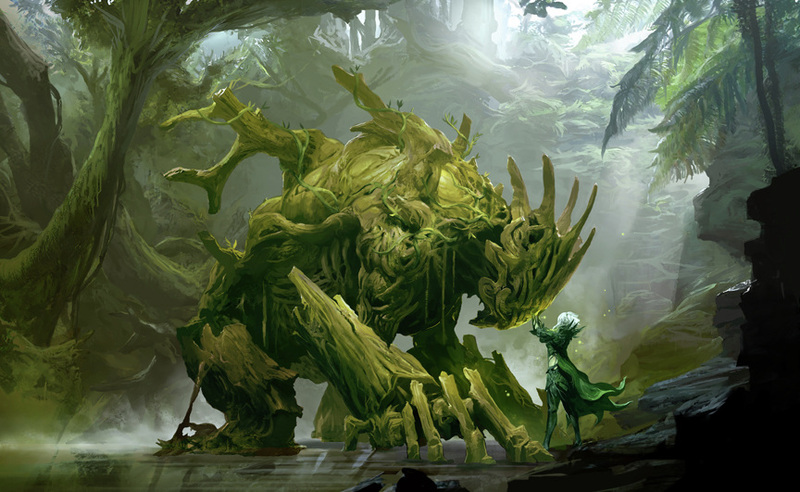 Distinctions: Great, giant treefolk prone to lying dormant for decades or centuries at a time, generally only roused from their slumber by their Aelvar caretakers in times of turmoil or in defense of their woodland realm. Their appearance is likened to that of ancient trees, their arms and legs thick as trunks and their entire being protected by thick bark rough to the touch, with their actual skin being smooth and sinuous. Their arms end in an assortment of branches making up their five-digit hands. Able to blend seamlessly into the forest they call home, they are easily mistaken for just another non-sentient lifeform. As avatars of nature itself, Skaugr do not perish from the passage of time and can live for countless ages if circumstances allow. Their thick, unyielding bark allows them to withstand blows that would lay waste to other beings. They possess immense strength, and do not waver nor flinch in defense of their woodland realm. Have a strong bond to the Aelvar and the Frostvatn (local Force nexus), and are capable of telepathy. ​As beings of wood and leaf, fire poses a significant threat to their kind. With their hulking size, they are incredibly slow to move and would not fare well against a single, faster opponent. Spending long periods of time in a deep slumber, should the need arise they must first be awakened by the Aelvar. General behavior: Docile and harmless unless their forest is threatened, they can slumber for centuries at a time until roused by their Aelvar caretakers. When awake they mostly wander the woods of Averlorn interacting with the local wildlife, patrol the borders alongside the elves, or aid in construction by providing heavy lifting. They have shown numerous signs of possessing vast knowledge and intelligence, yet have few ways of demonstrating it. In an age long forgotten, for there was no-one around to remember in the first place, the world that was to become known as Midvinter was created. Among the very first beings to wander the then-green hills and neverending forests were the Skaugr; creatures carrying an uncanny resemblance to great trees. In these early times Midvinter was in fact not the cold and snow-covered landscape it is now known as, but rather a lush and temperate world where nature ruled supreme, for it would be several billion years until the very first Valkyri or Aelvar ancestors would take their first steps. At the time, the Skaugr were the shepards of all wildlife, from the smallest forest mice to the gryphons soaring the skies as the apex predator. The concept of war was still foreign, thus the ground wore no scars of battlefields past. But this state of untouched serenity would not last forever, however: The conflict between Jedi and Sith which had ravaged so many worlds before it eventually came to Midvinter, then but an unknown and seemingly uninhabited forest world. Such devastation was endured that it shook the planet to its core, setting off massive earthquakes and erupting volcanos. This, along with the polar ice caps melting, caused the world to reshape its landmasses along with an ice age which would come to become synonymous with the name 'Midvinter'. The Skaugr's numbers were utterly decimated by these events, peacefully tending to their forests and woodland creatures even as fire rained down from above. Only a handful of saplings survived within the dense forest that would later become named Averlorn. By the time they awoke from their slumber it had been several million years since the devastation which all but annihilated their kind, and by now there were others who would lay claim to being the first to walk Midvinter's lands; such as the Beorni, the great ursine species having evolved from the common bear. Their kind roamed the vast tundras and mountains, however, and showed no desire to intrude upon the Skaugr's last refuge. So the treekin resumed their duties, sheparding the significantly smaller forest and its inhabitants for many thousands of years until eventually a new creature was found stalking their woods. These were no mere beasts, but in fact a clearly intelligent, fully sentient people. They were born of the forest, same as them, and the Skaugr recognised this. Rather than remain secluded, they revealed themselves in good faith despite the great risk it presented to their kind. The young humanoid race saw them for what they were - nature itself come alive. Before long the two species formed a pact; a bond of symbiosis, where the Aelvar ancestors would see to it that their woodland realm would remain untouched by time and invader alike in order to protect the Skaugr. In return, the treekin would aid them in their endeavours and teach them the many secrets of the forest, in turn ensuring their survival. As war ravaged the lands throughout the ages that followed, Averlorn has been kept safe and serene. And so long as Averlorn remains, so shall the Skaugr - first of Midvinter's children. Edited by Thurion Heavenshield, 08 July 2018 - 01:36 PM. So, could you give an age range for the race. If you want to put over 1000 then that's acceptable. Also could I get a level on their intelligence? Edited by Yuroic Xeraic, 03 July 2018 - 10:19 AM. Changed average age to: "Hundreds of thousands of years." If you wish an exact number that could be arranged, but the idea is that they cannot die from old age. Added the following line under General Behaviour: "They have shown numerous signs of possessing vast knowledge and intelligence, yet have few ways of demonstrating it." Also added this under strengths: "Have a strong bond to the Aelvar and the Frostvatn (local Force nexus), and are capable of telepathy." This looks fine. Another interesting addition to Midvinter. I always love the stuff you add to Midvinter. Can I get you to add 'Type I' to what they breath? Is there a link to the local force nexus? If so can you put that in there? And they don't have *any* beliefs? Why is that? The Force nexus is mentioned in the Aelvar sub, under Beliefs.